I can't believe it's already turkey time! How did it come so fast? De verdad, I blinked, and the week was over. It started last Tuesday with splits with our Hermana Leader. A member showed us where several inactive members live; there are soooo many here! Wednesday, I played babysitter and stayed with sick Hermana Christenson so that Hermana Vazquez could get some work done in her area with Hermana Neff. That same day, investigator Virginia (who I used to teach on the other side of Ivan Guzman when it was all one area) passed her baptism interview! She'll be getting baptized this Saturday!!! On Thursday, us 4 missionaries taught the stake mission prep class about the First Vision and the Book of Mormon; it was so much fun! Those youth are so strong and willing to learn, ay mi madre, sometimes they have 40 kids come to class!Friday, we had zone conference with elder Hugo B. Martinez of the Seventy/counselor in the Caribbean Area Presidency. I learned how to more effectively teach keeping the Sabbath day holy and about how to plan conversion. We set some awesome, new mission goals concerning baptism, and wow, it's amazing to see how much this mission has improved in all aspects during the past year or two. I was asked to bear my "final testimony" at conference; how surreal that I've arrived at that point. On Sunday, I played a piano solo in sacrament meeting, and we had a fantastic family history activity for the ward that evening! So many people came, including Starlin, Victor, and Wbert, yippee! I got to visit my third area, Bella Vista! Unlike in Ocoa the week before, where I felt like it was a dream, I felt like I had never left BV:) I saw my favorite member, who seriously are like my family, and I found out that my investigator who was recently baptized, Alberto, is now a counselor in the ward Young Mens presidency, yay! I was looking through my agenda from my first transfer and found the list I wrote of things I took for granted: accessible water, doors, paved streets, privacy, air conditioning, electricity, plumbing, stable houses, a job, trustable food, traffic laws, cars, carpet, wood and tile floors, running and/or clean water, handheld and electric mixers, the ability to sing on key, restaurant health codes, parents who are married, clean transportation, churches close to us, cute dogs/non-disease-carrying dogs, cleanliness in general, clothes, family who loves and supports me, pianos, toasters, dishwashers, crushed ice, fences, windows, electric stoves, washing machines and dryers, quiet neighborhoods, appropriate social conduct/behavior, church members who fulfill their callings, ranch dressing, waffle makers, whipped cream, powdered sugar. Wow. That's a lot. Since then, there are many more things I have become grateful for. I am grateful for the chance to learn Spanish. I am grateful for what I've learned from every companion. I am grateful for my testimony. 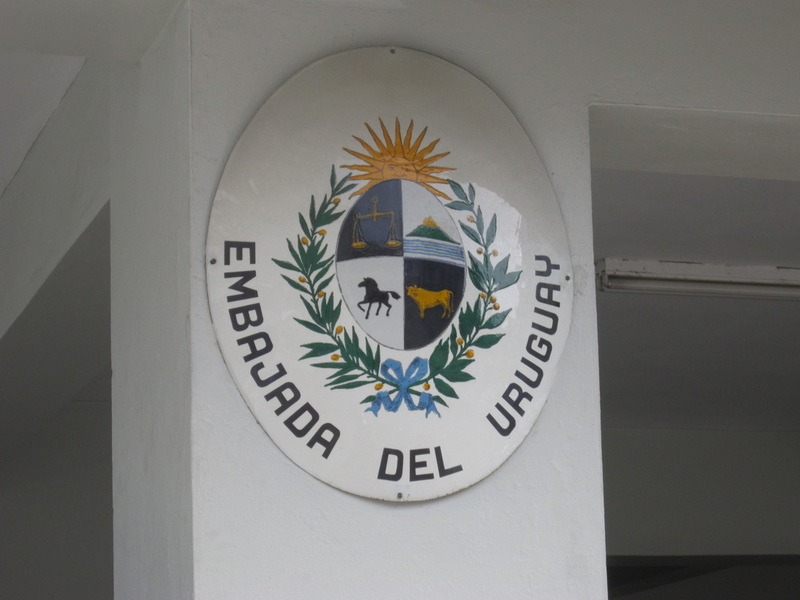 I am grateful to have served a full-time mission in la Republica Dominicana. I am grateful for everyone I have met here, for the unfailing faith of these Dominicans, for my leaders, my family, the sacrifice and dedication of the missionaries here, my patriarchal blessing, a knowledge of the restored gospel of Jesus Christ, His perfect Atonement, our loving Heavenly Father, and so much more. There is ALWAYS something to be grateful for, no matter how hard life gets--especially when life is hard. As we live with an attitude of gratitude, we choose to be happy; I relearned that principle this week. I hope you all think of something to be grateful for this week and remember that it--and everything--is from our Father in Heaven. Alma 34:38 "Live in thanksgiving daily." Doctrine and Covenants 78:19 "He who receives all things with thankfulness shall be made glorious." My baby and granddaughter are growing up so fast--they turned 2 months old today, whoopee! Kind of funny because it was Hermana Vazquez's cumplemes (monthly mission birthday) yesterday, Hermanas Neff and Christenson's today, and it's my last one tomorrow. Unexpected situation story time. About 2 months ago during a zone activity at the church, a Haitian man came asking about an auto sufficiency class. I ran into him again a couple of weeks ago and found out he wasn't a member of the Church; his name is Junior. We invited him to church, he came, and promptly told us afterward, "I want to be baptized. What do I need to do, and when can I?" WHAT?! I was in total shock and stumbled to form words. We had a lesson with him and Bishop, who checked to make sure Junior was here legally, that he wanted to be baptized for the right reasons (not just take the Church's auto sufficiency and English courses), was legally married, etc. Junior had read the whole Restoration pamphlet in preparation for the cita and had several questions & doubts, especially about a living prophet...I really have no idea where all this is going to go. He came to church again yesterday and has a baptism date for January 7th; please pray for him to have an open mind and to be able to recognize the impressions of the Spirit. "I say unto you, that I know of myself that whatsoever I shall say unto you, concerning that which is to come, is true; and I say unto you, that I know that Jesus Christ shall come, yea, the Son, the Only Begotten of the Father, full of grace, mercy, and truth. And behold, it is he that cometh to take away the sins of the world, yea, the sins of every man who steadfastly believeth on his name." A lot of plans with investigators fell through this week, but because that happened, we were able to find where several less-active youth live and got to know them. Almost every single one of them is the only member of the Church in their family; they have to be extra strong to be an example and defend their beliefs. They need a lot of love and support, and the whole ward is focusing a ton on helping them. Story time:) So last week, we were simply knocking on a door to contact whoever lived inside, and a 10-year-old boy comes across the street and very politely tells us that the family wasn't home. He was a really cool kid, and when we told him about where and when church was, he was super excited to go! 30 seconds later, we found his mom, who was also totally interested in the Church! Her name is Noelia, and she had some awesome questions. We set up an appointment for this week, and she was very receptive when we taught her on Wednesday with a member. She accepted right away that Thomas S. Monson is our living prophet (which never happens, normally people here have a hard time accepting a modern-day prophet) and was so sweet when I showed her his picture; she said, "He looks so kind! ":) At the end of the lesson, she told us that she had a question. She then proceeded to tell us that her baby girl passed away 17 years ago. Noelia has searched in many churches for answers about how or when she can see her daughter again. It was such a tender, special moment as she realized that the restored gospel of Jesus Christ could provide her with answers. She told us that it wasn't by accident that we found her, that everything happens for a reason, that we were sent by God. I am SO grateful that the Lord guided us to Noelia; that miracle has increased my faith, and we can't wait to teach this woman who has been so prepared to hear and accept the gospel. Miracles are real, people. God knows exactly who and what we need. Before the mission, I always said that if I had a testimony of anything, it's that everything happens for a reason; I still testify of that today. If we put our trust in Him and accept that His plan for us is perfect, we need never worry. One way or another, it will all be okay, because He knows best, and if we have confidence in that, we will have peace and happiness. "He that handleth a matter wisely shall find good: and whoso trusteth in the Lord, happy is he." Many people here think that this holiday is of the devil haha but with 3 Americans in the house, we weren't going to let it pass by! Yep, that's right: Hermana Vazquez and I officially have our brand-new babies!! 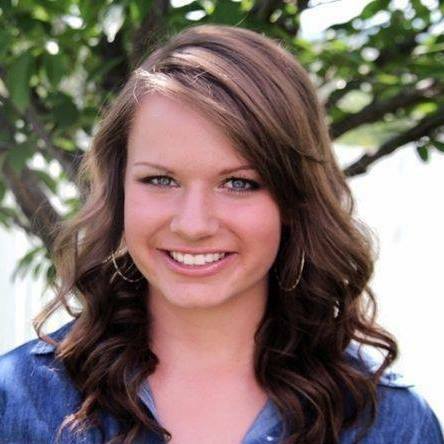 My second daughter is university basketball player Hermana Neff from Snowflake, Arizona. She is unlike any companion I've ever had, and we're doing great together:) The last time I had an American companion was in January, and the last time my comp was taller than me was my trainer/mom (guess it was a recessive gene;D); it's really weird getting used to. Hermana Vazquez's baby is Hermana Christenson from Highlands Range, Colorado, who's super good BYU friends with my cute cousin, Abigail Sears! It has already been so much fun living with both of my daughters and my granddaughter--it's going to be an awesome transfer together! Now that we've divided Ivan Guzman, both companionships have more time to visit everybody we need to and find new investigators. We don't have many investigators on my side, so Hermana Neff and I have spent lots of time searching for prepared people and helping less- and inactives. We hadn't found anyone new the whole week...until we taught a dad named Doni yesterday, who has 5 kids and multiple siblings who've been members of the Church for 15 years!! Missionaries visited him 2 years ago, he wasn't ready, but now may be the time for him and his family to accept the gospel! "Once we enter into covenants with God, there is no going back. Giving in, giving up, and giving out are not options. In the kingdom of God, there is a standard of excellence for exaltation. It requires valiant discipleship! There is no room for average or complacent disciples. Average is the enemy of excellence, and average commitment will prevent you from enduring to the end." ﻿October 24, 2016--WBERT GOT MARRIED AND BAPTIZED!!!!!! ¡Saludos de la locura en Ivan Guzman! Throughout the whole week, we were organizing Wbert and Mariela's wedding, a process that is much more stressful in real life than imagined as a kid haha:) Well, Friday finally came, and after two and a half hours of waiting while eight other weddings happened, the judge married Wbert and Mariela!! It was fantastic!! They were both so cute and happy:) There was a stake thing that night, so we had to wait until the next day for the reception. Saturday morning was spent decorating the chapel, and the plan was to have Wbert's baptism at 3, the reception at 4, end and clean up at 5 to have everything ready by 5:30 for stake conference at 6. Nutsy, right?? But then Mariela took way too long to get ready and arrive, so she didn't show up until 3:45 ahhh which is when we finally started the baptism, and somehow, everything turned out okay from there. The first Elder to find and teach the family (who's now the AP and finishing his mission this week) baptized Wbert, and ti was so sweet:) He has sacrificed so much to get to this point, it's unreal. Many people came to support him and Mariela, and the reception was a hit! Yippee! While our apartment is being hacked apart today to fix the water system, we have been organizing everything because something very special and absolutely insane is going to happen. Friday night, President Nuckols called and said that our area is going to be split/have two companionships...and he asked both Hermana Vazquez and I to train new Americans!!!!!!!!! I AM GOING TO BE A MOM AGAIN AND A GRANDMA AT THE SAME TIME!!!!!!!!!!! I am seriously living "Father of the Bride 2" hahaha can you believe it?? We can't! As you can imagine, Hermana Vazquez is scared to death--she's just finishing her own training and now has to do it with someone else. We are going to need lots of your prayers this week for everyone to stay calm and adjust okay. These past two transfers with my daughter have been the best two of my entire mission. Never have I been happier or had more visible success. In less than three months, four investigators have been baptized--all of whom are or will be worthy Priesthood holders. We pulled off a wedding and survived--even enjoyed:)--whitewashing our area. In addition, an investigator I found and taught in Bella Vista (Alberto) was baptized on Saturday:) The Lord has poured out His blessings more than I've ever been able to imagine. This truly is His work and glory. As I head into the last transfer of my full-time missionary service, I have to work harder than ever to do His will. This is the time to use everything I've ever learned and sprint to the finish line. If I'm obedient and give everything I've gt as I help my second daughter in these last six weeks, I know the Lord will strengthen us and bless this area more than we can comprehend. October 17, 2016--VICTOR GOT BAPTIZED!!!! ¡Hola de la Republica Dominicana! We actually had family home evening last Monday night with Victor's family and la familia Mateo, a powerhouse recent convert family who gave us the reference of Victor. Last night, we had a noche de hogar (FHE) with our ward mission leader and his wife (who live below us) and Wbert's family! It was super awesome, and Mariela (Wbert's soon-to-be wife) especially appreciated the friendshipping. She said that if she were getting baptized right now, she would choose me to baptize her haha but Mariela knows I don't have the priesthood and can't:) We went with her on Friday morning to fill out the marriage paperwork and pay and get everything arranged for the wedding this Friday!! So exciting!! Then Wbert will be baptized on Saturday (he passed his interview yesterday! ), and the wedding reception will be after (because there's a stake temple trip on Friday night, so nobody would be able to attend the reception). Thursday as very fun with Hermana Irwin from California when we went on splits in her area! We met a man who actually knew what and where Utah was haha and, strangely, a woman named Cristo, which means "Christ." Yesterday was also super divertido in a stake fireside for the youth; the jovenes had been asked to bring non-member friends, and so many people came! Starlin was darling and sang in the "future missionary" choir, and guess who else was there because he's now Young Mens president? My Bella Vista ward mission leader, Neal, and his fabulous wife, Jasmin!! They are the best ay mi madre it was so fun to see them; they got married and moved to this stake the same week I got transferred here:) The missionaries did a skit and it was a blast! "When the focus of our lives is on God’s plan of salvation, which President Thomas S. Monson just taught us, and Jesus Christ and His gospel, we can feel joy regardless of what is happening—or not happening—in our lives. Joy comes from and because of Him. He is the source of all joy." I hope you all feel lots of joy this week! Love you! We got to do a musical number at the baptism of the other Hermanas' investigator in the district, so that was fun! On Friday, we woke up at 4:30 am so that Hermana Vazquez could go do Visa stuff with the daughter of Hermana Flake. 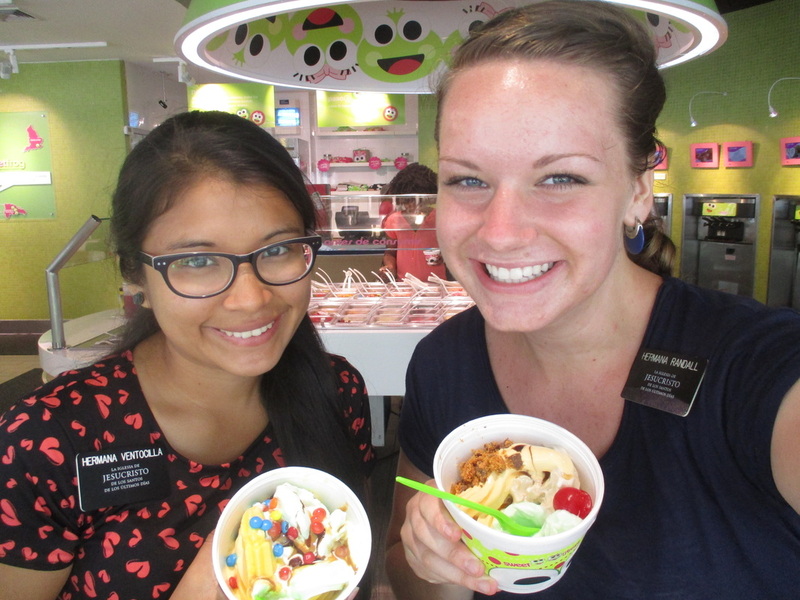 Hermana Flake was my MTC companion, so it was super divertido to be her comp again for a day! Not so great for our daughters...they took the wrong bus on the way back, crossed the mission border, and ended up driving 40 minutes into the East mission; poor things, they couldn't even call us because they had accidentally both taken the cell phones. During all of that, the rest of us had zone meeting, where we talked a lot about helping entire families, something Hermana Vazquez and I have been focusing on a lot. The whole "sin shall be upon the heads of the parents" thing has been a theme of this week. The biggest example was Natasha's family. She was all ready for her baptism interview on Saturday...and didn't show up. Turns out her parents flipped the switch the night before and don't want her to be baptized right now. The drunken dad convinced the nice mom, who'd accepted the baptism invitation herself, that Natasha should wait till she's older. Since she's a minor, she can't be baptized without her parents' support. Man, it broke my heart. I just stood in the street and cried, thinking of the lost blessings and how this would affect Natasha. She's prepared and wants to do this for the right reasons. People, it's a commandment to be baptized. We're talking about salvation here. But all things happen in God's timetable, so I just have to trust in Him and know that someday, somehow, things will work out, and Natasha will be blessed. "Be open about your faith in Christ. When the occasion presents itself, speak of His life, His teachings, and His incomparable gift to all mankind. … Share His powerful truths from the Book of Mormon. He has given us this promise: “Whosoever … shall confess me before men, him will I confess … before my Father … in heaven” [Matthew 10:32]. I promise you that as you pray often and sincerely for opportunities to “stand as a witness of God,” those opportunities will come, and those who seek more light and knowledge will be put before you. As you respond to spiritual promptings, the Holy Ghost will carry your words to the heart of another, and one day the Savior will confess you before His Father." Act on the promptings of the Spirit--every single one--and you'll see miracles:) You never know who needs your help! I hope you pray for a missionary opportunity this week and feel the love and guidance of the Lord! Love you all so much! ¡Disfruten su semana! Espero que todo este bien con ustedes:) This week was crazy and memorable, and I couldn't ask for anything better! The theme of the week was my mission president: President Nuckols. Last Monday, we had that choir practice at his house. Then we had interviews with him and Hermana Nuckols. That night, Hermana Vazquez taught with a counselor in the bishopric and a member woman, while President Nuckols and the stake president went to teach with me and Marlina Mercado (the American mom who owns our apartment). Um, hello, talk about pressure!! We first went to teach Victor and his mom, who we've only met once, but he misunderstood and didn't come, so we taught his mom and step-dad. We had a super powerful lesson about Jesus Christ and the Restoration, and now they better understand why their son chooses to wake up at 5 am for seminary and is doing so much to learn about the gospel. 11-year-old Natasha is doing great! She will be getting baptized on the 15th and went to General Conference yesterday! 11-year-old Eduardo went to Conference as well and is progressing slowly but surely. He knows that this is the only true church and is preparing to be baptized on November 5th. We found ORO PURO (pure gold) this week: 24-year-old Virginia! She's a reference of her aunt-in-law, who's a member. Apparently Virginia has been to church before, celebrated her wedding reception in the chapel, and presented her baby daughter in the church when she was born. 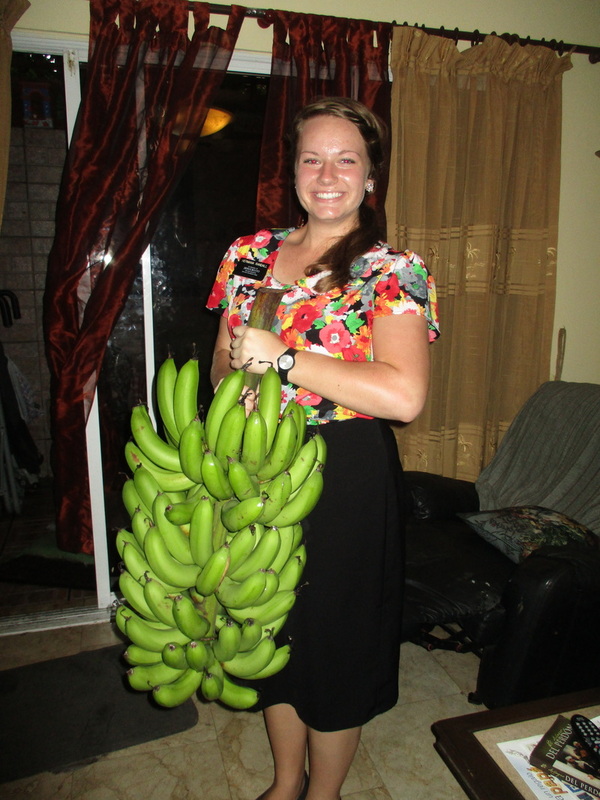 Even with all that involvement in the Church, the missionaries have never taught her before, so we're the lucky ones! She read the entire Restoration pamphlet in one night, understood and remembered in perfectly, is praying to know that the Book of Mormon is true and that this the true church, received an answer that Joseph Smith was a prophet called of God, and wants us to teach her every day! Virginia is incredible!! Then, to top off the week, it was General Conference!! Crazy to think that one year ago, I could hardly understand what was being said when I watched it for the first time in Spanish, and now it's a million times easier:) It was amazing to hear so much about prayer, missionary work, overcoming the natural man, repentance, and a ton of other wonderful things. I loved Evan A. Schmutz's talk about having trials fora reason, and Elder Gary A. Stevenson's Book of Mormon talk was perfect for investigator Angela, who was there for that session. It was special to see J. Devn Cornish speak because he's been my Area President my whole mission up until his recent releasement. I received so many answers to the questions I had previously written and pondered about, and it was wonderful to listen to Prophet Thomas S. Monson speak. The Saturday afternoon session was the most incredible one of my life. We called it "the missionary session;" what a once-in-a-lifetime opportunity to hear it as I serve as a full-time missionary. When Elder Yamashita spoke directly to the missionaries, I can only describe it in Joseph Smith's words that he used to describe reading James 1:5: "Never did any passage of scripture come with more power to the heart of man than this did at this time to mine. It seemed to enter with great force into every feeling of my heart." I have never been more grateful to be a missionary called of God. I have never had more animo to share the gospel. I left the church with an energy like never before. I wanted to contact every person I saw, cry repentance unto all, and invite them to the next day's Conference so that they could hear what our living prophet and Apostles have to say. I love this gospel, I love our Heavenly Father, and I love my Savior. The work is booming here in Ivan Guzman! So many people have accepted the invitation to be baptized, and our investigators are the best! Paola and Glori (Anthony's sisters) are excited to be baptized on November 11th, and we're still working on getting their inactive mom (Angie) to church. But guess what? Anthony passed the sacrament for the first time yesterday!! So special:):) Up until this month, the Young Men would never do it, but that has changed; Anthony, Starlin, and two other Young Men who were baptized this summer were the ones to repartir la Santa Centa, and it was the first time for one of those other two! They're setting such a great example. Plus, new Young Womens and Young Mens presidencies were called yesterday, which will make a huge difference because they're all super strong members. We're so excited for the awesome potential here! A lizard froze to death in our fridge. Do I have any idea of how it got in there? No. Am I completely disturbed? Yes. I also saw the biggest rat of my life during a lesson, but thankfully God helped me stay calm and not freak out. The adventures never cease:) That being said, we had quite la aventura getting to President Nuckols' house today. The first taxi driver told us to get in the wrong car for the second part of the trip, so we ended up almost crossing the mission border. Then we left our cell phone in the taxi, but we were able to get it back on our way to our area in the end, hallelujah. But the point of that trip was because I was asked to help sing at a dinner do-da for all the stake presidents, their wives, and some other leaders that we'll have this Friday. We spent all of today in President's house rehearsing; I'm doing two duets with another Hermana and singing in a small ensemble with Elders. Wish us luck! The women's session of General Conference was fantastico! I loved what Bonnie L. Oscarson said about having a firm testimony in these trying times of 1) the fact that Jesus Christ is our Savior 2) the Restoration of the gospel of Jesus Christ 3) temple covenants. Serving a mission has absolutely strengthened my testimony of those things and of what President Uchtdorf taught about faith. He said that having faith is trusting in God's will. I had to trust that God would help me learn a new language and survive living in a very physically-demanding, third-world country. When I was called to serve in Bella Vista directly after Los Angeles, the two most "unsuccessful" areas of the mission, I had to trust in God that I would mentally be able to handle to continue intercom contacting all day an not give up searching for people who were prepared to accept the gospel. I had to trust in God when He asked me to whitewash an area and train a new missionary at the same time. And guess what? It all worked out. Why? Because He knows best. He knows us perfectly and knows perfectly well what we need to experience to become more like Him. So if there's anyone in whom we can trust, it's our Heavenly Father. I hope you feel His amor perfecto this week and my love, too! ¡Nos vemos! What a super duper awesome week we've had in Ivan Guzman! (ee-VAHN goose-MAHN) Lots of miracles and the Spirit:) The best part was today: our temple trip!! That's why today is P-day. Since we only get to go to the temple twice a year, it's an extra appreciated visit. I'm SO grateful for the special Spirit that is found there; literally no where else on Earth can provide more peace. It truly is the house of the Lord. 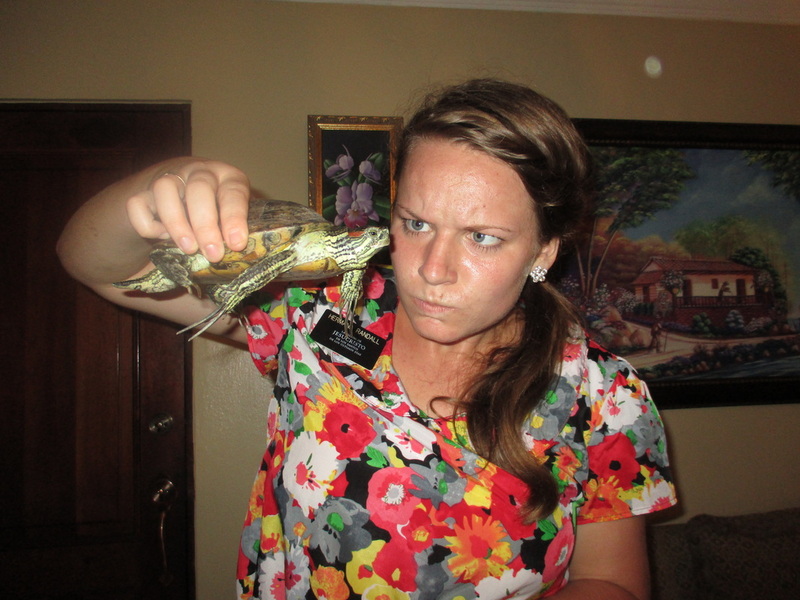 Besides the ants, leeches, and lizards that invaded the apartment, we had many other wonderful experiences! 20 ward members helped teach lessons with us(!) and we've been finding families who have member relatives. For example, the Holy Ghost prompted me so strongly that it physically lurched me to contact three people who were sitting in chairs on the side of the road; they turned out to be the parents and sister of a reactivated member who just baptized his wife! We taught them, and they said we can come back! Starlin and Anthony are doing splendidly, and things are gong well with teaching their families. I realized that I've talked so much about them that I've hardly mentioned anyone else! Hermana Vazquez (who is the tallest companion I've had since my trainer, by the way) and I are very fortunate to have muchos investigators. Two of them who have really stepped it up this week are Victor and Natasha. Victor (16) has been going to early-morning seminary and church for several weeks now and has a baptism date for October 8th. he read the whole Word of Wisdom pamphlet before our lesson about it and totally understood it! 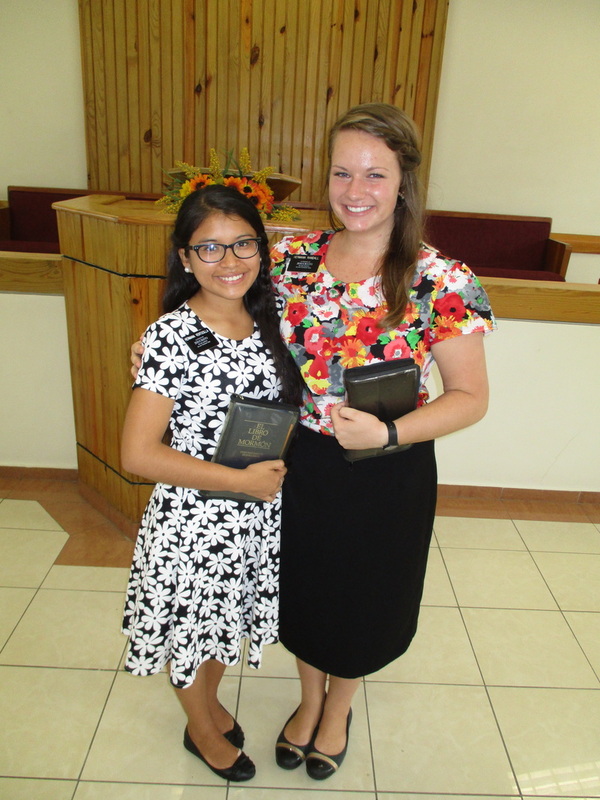 Hermana Vazquez and I have had a theme this week: the Book of Mormon. We've really worked on teaching it more effectively, and it's actually one of the two focuses of the month here in the DR Santo Domingo West mission. Super cool experience: we were simply walking down the street when a man saw that we were carrying Books of Mormon and asked if we were Mormons. Turned out that he had been taught by the missionaries five years ago but lost contact with them when he moved here. His name is Junior, he has a BOM, and he straight up said, "I want to be a Mormon!" What?! So we visited him, and he asked what he has to do to join the Church!! Then he cam to church on Sunday! Can you believe it? He's got some major Word of Wisdom problems, but if he's really committed to being baptized, I know he'll keep the commandment. "The Book of Mormon [is] the most correct of any book on earth, and the keystone of our religion, and a man would get nearer to God by abiding by its precepts, than by any other book." ﻿September 12, 2016--ANTHONY WAS BAPTIZED!!!!!!!!! ¡Hola de la República Dominicana! I am feeling just jolly today! Lots of awesome stuff happened this week, so I'll go in order. On Tuesday, our Hermana Leader/my old comp, Hna. Perez came here to Ivan Guzman to do splits, and I went with her companion from Panama. I had a very special experience with a reactivated teenager and her inactive mother, Cecilia, who has been attending a different church. Cecilia needed a boche con amor (a loving talking-to), and it was really emotional as she realized that her life was a lot better when she was active in the Church. Interesting: even though Cecilia still prays to God, she said she feels very far away from Him...because she's not feeling the Holy Ghost or receiving blessings since she's not keeping the commandments. In addition to her, Hermana Vazquez and I got to work with several less-actives this week for the first time this transfer, which I loved! Those 600 inactive members in my first branch, Ocoa, prepared me to help all the less/inactives I've been able to teach in my following areas. You have to be bold and firm with them, simply love them, and not judge. Guess what? 4 of them came to church yesterday after we visited, wahoo! Then Saturday finally came! Hermana Vazquez and I went to the church to fill up the baptismal font and drop off cookies for Anthony's baptism...but when we came back that afternoon, someone had gotten in, drained the font, ate some of the cookies we'd hidden, and took all the white shirts from the baptismal clothes closet. So that was disturbing. We still needed to clean the church, which someone had left totally messy after an activity the previous night, and Anthony showed up with two other Young Men and a small family to help out--so sweet! We hurried to get everything ready, find other baptism clothes, fill the font, but still couldn't get ahold of a bishopric member, who was supposed to preside, the ward mission leader hadn't showed up yet, who was supposed to conduct the service, and some people who were on the program never came. It was insane!! Every baptism has a story, like the hurricane rain that tried to stop Estarlin's last week. BUT we got things pulled together, and many people came to support Anthony, including his inactive mom and his 13-year-old sister, Paola. Estarlin gave a talk about the Holy Ghost, and he spoke as if he'd been a member for years! It was so amazing to see Anthony be baptized; when he went under the water and came back up, he felt like a huge weight had been taken off of him, and he felt an indescribable peace. His mom, Angelina, said, "The next to be baptized are my daughters and my husband!" The next day, he received the gift of the Holy Ghost and was ordained as a priest in the Aaronic Priesthood!! AND Estarlin passed the sacrament for the first time!! I have never felt a joy like that, and I have ever felt so honored to be a part of the Lord's work. These two valiant best friends have completely changed their lives and are changing others' as well, including mine. It was also the primary program that day, and it was very special to hear those darling children testify and sing of the simply truths missionaries share every day--but it's a lot cuter when they do it:) 9 investigators and 14 recent converts came, and the church was packed! Plus, another recent convert youth, Duncan, received the Priesthood! It was the best, most incredible Sunday of my whole mission:) Oh, and we got transfer calls on Saturday night; Hermana Vazquez and I will be staying together for another transfer as I finish training her (she turns 2 months old tomorrow!). P.S. Gracias, Randalls, for all your sweet notes from the family reunion! I just got them and love them so much! ﻿September 5, 2016--ESTARLIN GOT BAPTIZED!!! How are y'all doing this sunny day? I, for one, am doing much better! The MTC doctor took my stitches out on Wednesday, and he said that they're healing well! The 24 hours after are the most important to keep the wound clean and basically not do anything, so I spent Thursday with the Mercados (the part-American family I told you about last week) at Brigham Young School; I just sat in the office with Hermana Mercado with my foot elevated and read the Book of Mormon:) I did the same thing on Tuesday, and we did it so that my companion, Hermana Vazquez, could go on splits with another member and still teach. By the time I starting teaching again on Friday (after a week and a half indoors), I was a lot whiter and my hair was darker haha:) We had the funnest lesson with Anthony, his sisters, and Estarlin about the 10 commandments:) On Saturday morning, Anthony had his baptismal interview, and he passed with flying colors! He will be getting baptized on the 10th!! We are all ecstatic:):) Plus, his sisters and a reference friend all came to church with us yesterday, yippee! Sabado was the big day! The plan was to have Estarlin's baptism start at 6:30pm on Saturday, but there was a crazy, massive rainstorm, so no one was walking to the church. We were worried that the baptism wasn't going to happen, but we regained our faith, and guess what? Estarlin and 3 of his friends came in the pouring rain! And when the storm calmed down, more and more people arrived, including Estarlin's mom! She loved the baptismal service and felt the Spirit very strongly; we're going to focus on teaching her and her husband more (the one who built the baptismal font in the temple here). Anthony offered the opening prayer, and the Young Mens president baptized Estarlin. He was SO happy and bore such a sweet testimony. I'm so proud of him and the changes he's made in his life--he truly is a new person. To see in white and enter the waters of baptism was the best thing ever. He illuminates the light of Christ and is an incredible example to all who know him. During church yesterday, he received the gift of the Holy Ghost. It was a beautiful blessing, talking about serving a mission and raising his future family in the gospel. Later, he received the priesthood! Estarlin would have been ordained as a priest because he's 16, but his birth certificate was made a year later (very common here to have major document problems) and states that he's 15. The mission leaders said to put his real age on the forms, but the stake president said to put 15, so in the end, Estarlin was ordained as a teacher, and the ward really supports him. Estarlin's example and testimony have strengthened mine. He is the second investigator I've been able to see baptized on my mission; he's not my investigator or my convert--he's the Lord's. Estoy muy agradecida que Dios me permitio a ensenar un joven con un espiritu tan grade y maravilloso. Tengo fe que va a ser un lider fuerte y poderoso en la Iglesia. El esta siguiendo el ejemplo de Jesucristo, nuestro ejemplo perfecto. Estoy feliz por este tiempo a ser Su sierva. I hope that everyone enjoyed/survived the first week of school! Summer never ends here, so no biggie for me haha. However, my week was a tad different--let me tell you about it! 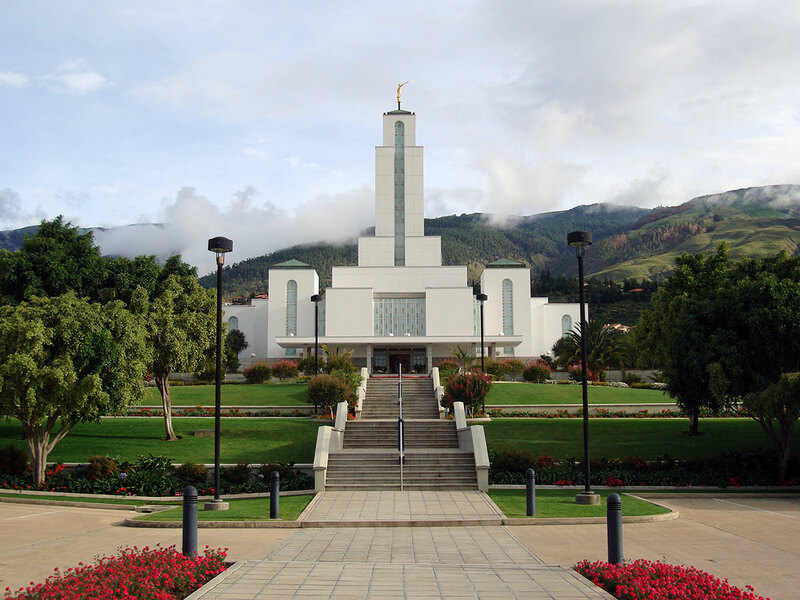 Wednesday morning, I woke up with a fever, and the mission president's wife drove us to the MTC, where the doctor for all Caribbean missions works (cool fact: he was the Utah Jazz's doctor for a few decades). He took a look at my foot, and I got the rest of the medicine I needed. Hermana Vazquez and I tried to get a hold of members who could go on splits with us so that she could still work while I stayed with other members. Friday night, we finally got something worked out, but up until then, "s" defined the week: stitches, studying, sleeping, silence, sitting. 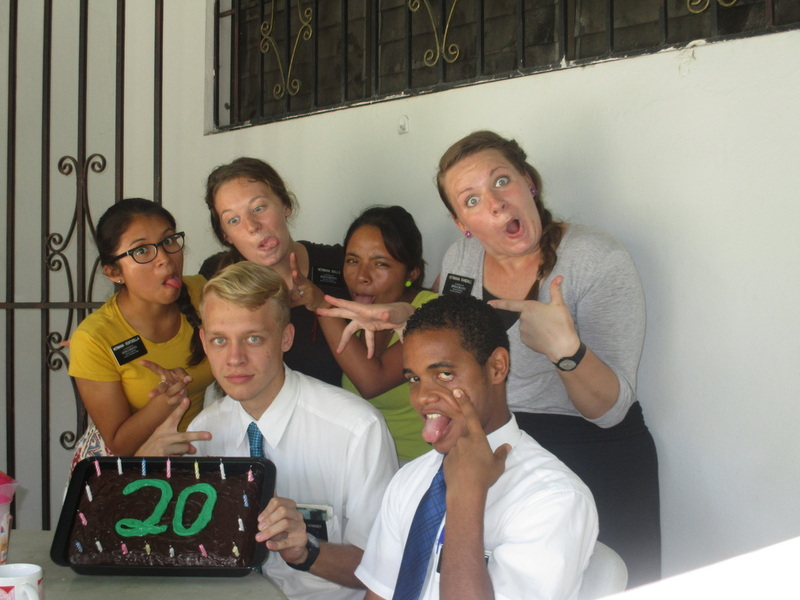 I couldn't believe that this was happening right now: the busiest time of my whole mission, Estarlin's baptism coming up, so many investigators to teach and members to visit (in whitewashing, establishing good relationships with members is as important as the investigators, and seeing as some of these members haven't been visited by the missionaries in years, we've got a ton of work to do). But I remembered what the YW president said prior to the accident, and I decided to count my blessings. For one, I got to stay safe and dry in the midst of hurricane season starting, where it poured and poured every day this week. It even hailed today, whoa! I realized that I've been talking like I was there in person for all that--I wasn't, but my comp was with members. She got to work all Saturday and Sunday while I stayed with 2 member families who live in our apartment. One of them is la familia Mercado; the husband is Dominican, and the mom is a BYU graduate from Washington. They met while serving together here, raised their 6 kids in the States, then moved here to start a school (Brigham Young School, which is preschool through high school) and build some apartments (they're the owners of ours). Their 2 youngest kids who live with them, 12-year-old Naomi and 9-year-old Jacob, remind me so much of my own siblings, Julianne and Nathan, and the parents are like my adopted ones in this ward. It's been fun speaking so much English with them, and I'm so grateful for all they're doing to help us out! Saturday afternoon, I went to Brigham Young School's first graduation with them, which was unlike any graduation I'll ever attend again. Remember that everyone believes in God in this country and that they can openly worship Him, like pray in school and stuff. So there were prayers and talking about God during speeches--it was really cool! Hermano Mercado even used scriptures from the Bible AND the Book of Mormon, HA so awesome!! I'm so grateful to have been born and raised in a country that was founded in order to have religious freedom, and I'm incredibly thankful for this opportunity to serve in a place where everyone loves God so dearly and recognizes that they have everything form Him. 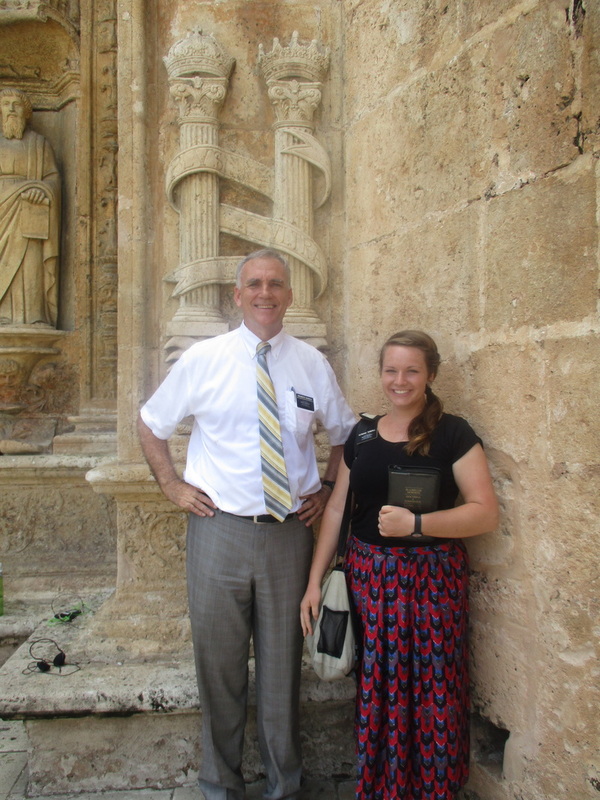 Serving here among literal Lamanites helps me better envision what it was like to live in ancient, Book of Mormon times when whole nations believed in Jesus Christ and our Heavenly Father; it makes the scriptures feel even more real. 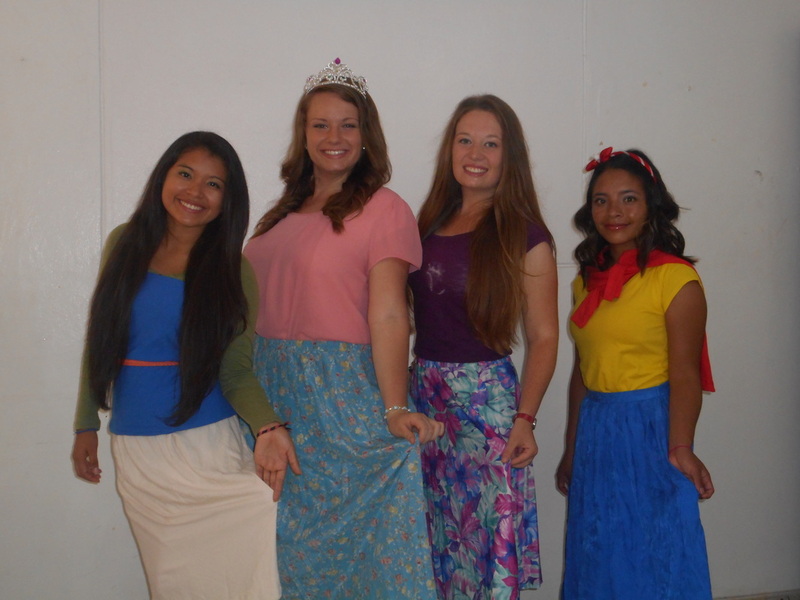 My love for them has grown so much as a missionary. I'm just feeling so grateful for everything right now:) Me encanta ser misionera de la unica iglesia verdadera: la Iglesia de Jesucristo de los Santos de los Ultimos Dias. I think I previously shared this scripture, but it fit my thoughts this week. Alma 17:11 "And the Lord said unto them also: Go forth among the Lamanites, thy brethren, and establish my word; yet ye shall be patient in long-suffering and afflictions, that ye may show forth good examples unto them in me, and I will make an instrument of thee in my hands unto the salvation of many souls." Friday, we had zone conference, whoot whoot! I love this opportunity we have once every other transfer to learn how to teach better, make new goals, and be better missionaries! A recent convert form our ward, Paulina, spoke in the conference about how the Elders found her and a bit about her conversion. She's 73, is full of Dominican sass, and such a trooper! We spent a couple hours practicing in small groups with MTC teachers about the Restoration, the Atonement with repentance, and the law of chastity. The latter theme was especially helpful because Hermana Vazquez and I were asked to teach the Laurels in Young Women about it yesterday, which went really well! Saturday was fun as well because it was the stake primary cultural performance for the anniversary of the primary. We watched a wonderful video about how the Church started in the Dominican Republic; go look up '"Las Manos del Senor en la Republica Dominicana" in English':) Then every ward did a presentation about the main cities in this country with darling singing and dancing performances! They were SO stinkin cute! Saturday was also Carnival, so nighttime was crazy. Funny fact: there's a law here about how loud you can play music haha it's actually a problem, so police cars were driving around shutting off la musica. 48 Wherefore, my beloved brethren, pray unto the Father with all the energy of heart, that ye may be filled with this love, which he hath bestowed upon all who are true followers of his Son, Jesus Christ; that ye may become the sons of God; that when he shall appear we shall be like him, for we shall see him as his is; that we may have this hope; that we may be purified even as he is pure. Amen. There's still so much of the area that I haven't seen, but from what I have, it's classic Dominican: colmados (bedroom-sized convenience stores) and hair salons and mini lottery banks on every corner, music blasting all day long, tiny homes crammed together, everyone sitting outside on plastic picnic chairs, motors driving on sidewalks, fresh fruit and vegetable carts and trucks, the smell of car exhaust and fried garlic, roosters and naked babies running around, and oh so many God-believing people. I love it!!! My amor for this country has already grown so much in this city. It's a nice mix of everything here: apartments, middle and lower class homes, shacks, constant noise, but also a calm, pretty, green area because Los Caobas is the edge of the capital before you head to the South (reminds me of Ocoa, especially because I can see the mountains in the distance ;D). It really is the greatest area EVER!!! 15 "Yea, I say unto you come and fear not, and lay aside every sin, which easily doth beset you, which doth bind you down to destruction, yea, come and go forth, and show unto your God that ye are willing to repent of your sins and enter into a covenant with him to keep his commandments, and witness it unto him this day by going into the waters of baptism. 16 And whosoever doeth this, and keepeth the commandments of God from thenceforth, the same will remember that I say unto him, yea, he will remember that I have said unto him, he shall have eternal life, acccording to the testimony of the Holy Spirit, which testifieth in me." This week has been the definition of nutsy, but it's also been absolutely amazing! First off, I became a 'mommy'!! 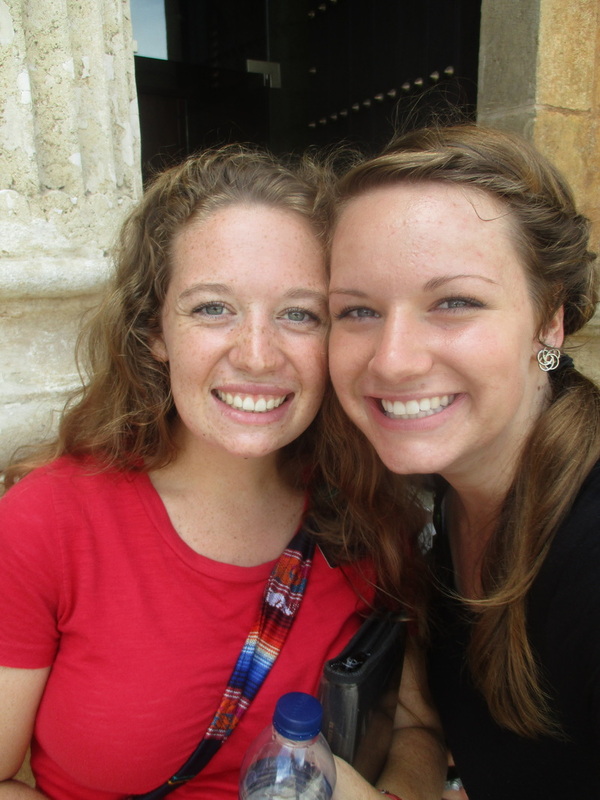 My 'daughter' is Hermana Vazquez form Aguas Calientes, Mexico, and she is so darling! We get along super duper well and are both so happy:) Imagine what a shock it was for her to find out that we would be whitewashing an area...poor thing. My goal had been for her to not be overwhelmed, but that was a bit inevitable in this case. She was less stressed after the second day, though, when we had the biggest rainstorm ever and lightning struck the power line right next to us and we were soaked to the skin all day long. She's been so brave, humble, patient, and kind. I'm so proud of my baby! We moved into our apartment on Tuesday after the big training meeting all morning, and we've had an interesting time getting rid of the Elders' smell and doing some deep cleaning. I'm actually liking being in a 2-person house, and being the only one to show Hna. Vazquez the ropes is helping me to be a better missionary. It makes me think of John 5:19, part of which says, "The son can do nothing of himself, but what he seeth the father do: for what things soever he doeth, there also doeth the son likewise." Remember how scared I was last week? Well, I'm absolutely ecstatic now! Ivan Guzman is the greatest area on planet earth with the best bishop and the most incredible ward ever! There are a gazillion returned missionaries in this massive ward, and everyone is so excited to help us out, especially since they haven't had Hermanas in 12 years! There aren't enough hours in the day to do all the wonderful work here. Seriously, there are SO many people who want to hear about the gospel, and they're all so kind; we've had to literally run like crazy people to teach them all! Hey, at least people are noticing us;) There were 5 baptisms on Saturday alone, and the potential for this area to keep growing is crazy. We invited more people to be baptized in 4 days than I have in the last 4 months!! And then 7 investigators came to church!! I love Ivan Guzman so darn much!! There are a million stories to tell, but for now, I just want to share about 17-year-old investigator Anthony. He was a reference of another investigator, and the Elders taught him about the Restoration previously. We had a perfect lesson with him last night about the Book of Mormon, and I want for everyone to have the joy in their lives that we all felt then. He is so prepared it's insane and cannot wait to be baptized on September 3rd. I'm beyond grateful to have the chance to serve in the most marvelous area ever and to get to teach such wonderful people with such an astounding companion. Alma 8:30 "And [Hermana Randall] went forth, and also [Hermana Vazquez], among the people to declare the words of God unto them; and they were filled with the Holy Ghost." I don't know if I've felt the Spirit so strongly and so often as I have these past few days. It's times like these where I wish I could be a full-time missionary for forever:) I've also felt the power and strength of all your prayers this week especially, when I've needed more energy and help than ever; thank you so much. I love being a missionary with all of my heart, and I love all of you!! ​-Adios to familia Polanco--they truly have been my family here, I'm so grateful for them. -Last night with the gang, love these ladies so much! Friday morning, my life did a ginormous somersault. President Nuckols called and asked me to WHITEWASH one of the Elders' areas!!! WHAT?!? Apparently, there are a lot of Elders leaving and a lot of Hermanas coming in this transfer, so a new area needs to be opened for las misioneras. That means I'll have to find everything without a companion who knows the area: people's houses, the grocery store, Internet, todo. It's going to be a ton of work, but that's not all...I will also be TRAINING a new missionary!!!! Ahhhhhh you can imagine that I've been freaking out a bit; there couldn't be a bigger challenge than to do both of these big things at the same time. For the very first time, President has asked both members of a companionship to train. Yep, Hermana Ventocilla will also be training!! 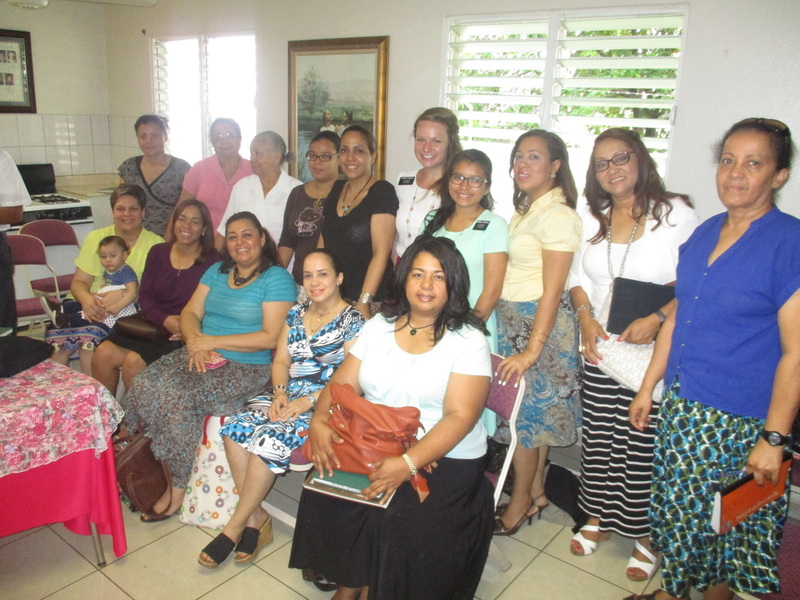 Plus, Hermana Balls will be finishing the training of a Jamaican Sister in another area! In that same house lives 2 of my old companions who are serving together: Hna. Flake (MTC) and Hna. Alas (my 'step-mom/mom' of Hna. Ventocilla); however, Hna. Alas is finishing her mission, so Hna. Flake will be training as well! All 3 of us will be 'mommies' in the same zone!! Entonces after 7 straight months of intercom contacting in 2 of the richest areas in the mission...I will be staying in the capital! Crazy! The area I will be whitewashing is called Ivan Gusman in the zone of Las Caobas, and Hna. 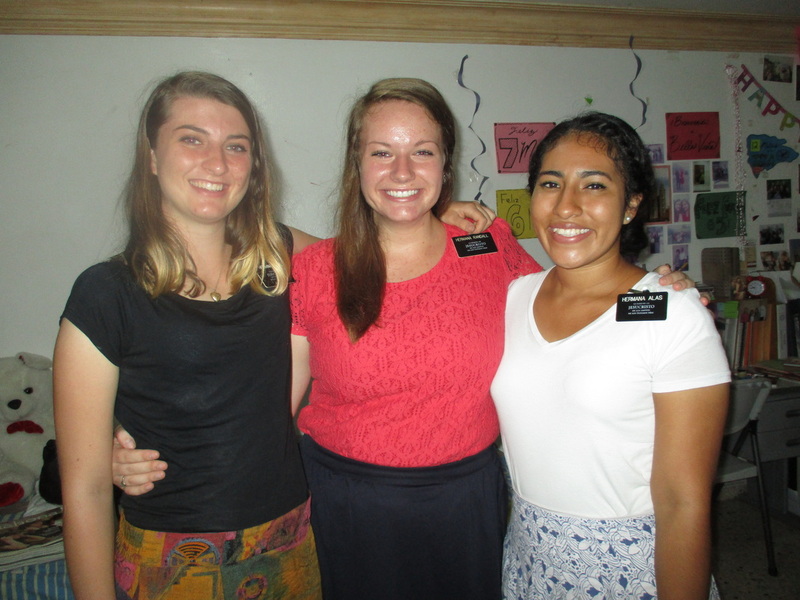 Balls will officially be my Hermana Leader for half of my mission, ha! I never imagined going back to a 2-man house, but wow, what an absolutely insane adventure I'm about to have. All of us have been feeling inadequate and anxious, but I read D & C 68:6 and Elder Mervyn B. Arnold's talk from this past General Conference. He said, "When [God] commanded Moses to rescue the children of Israel, Moses was afraid, just as many of us are afraid. Moses excused himself, saying, "I am not eloquent,...but I am slow of speech, and of a slow tongue." "Who hath made man's mouth?...have not I the Lord? "Now therefore go, and I will be with they mouth, and teach thee what thou shalt say." In effect, the Lord told Moses, "You can do it!" and you know what, so can we!" I'm about to learn, more than ever, the real meaning of the phrase, ¨Whom the Lord calls, he qualifies.¨ I will only be able to handle the responsibility with the Lord´s help. He has helped carry me during these past 3 transfers in Bella Vista, and He will guide me during these last 3 of my mission. The Spirit gave me peace yesterday during church, especially when I got to play the song I arranged, "Brillan Rayos de Su Luz," and shared my testimony. It's been hard saying bye to everybody, but I know that God needs me to be His servant in another place, and I'm willing to do whatever He asks of me. -My old companions, Hermanas Flake and Alas, came to visit Quisqueya before Hna. Alas goes home (it was her first area)! -Nothing like a green banana stalk! Those and plantains are super common here. -Adios Neal! Last time with our ward mission leader. 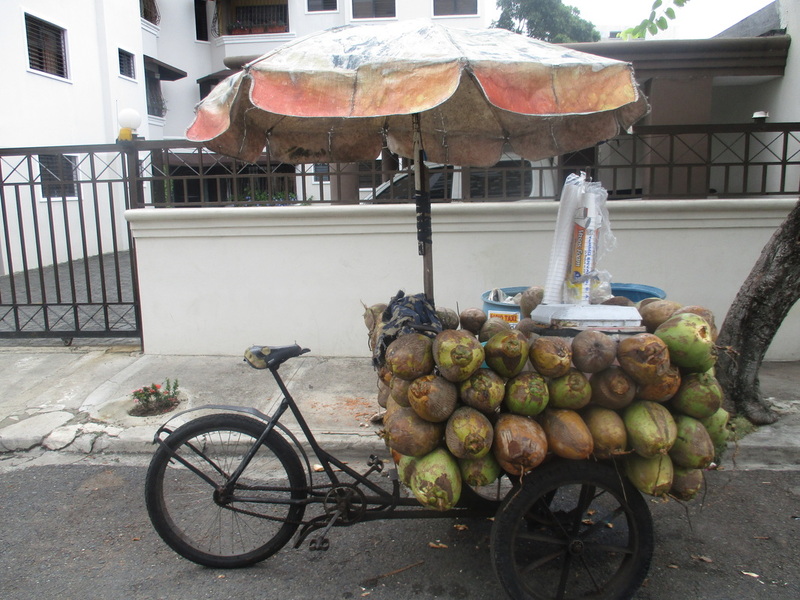 I know that it´s fun to live on an island and everything, but ay mi madre, the heat and humidity are a killer! Funny to think that I used to be the person to sleep with 5 or 6 blankets every night; now I just sleep on top of a sheet haha:) So in all that calor this week, we did a ton of contacting! Yay for giving people the chance to accept the gospel! 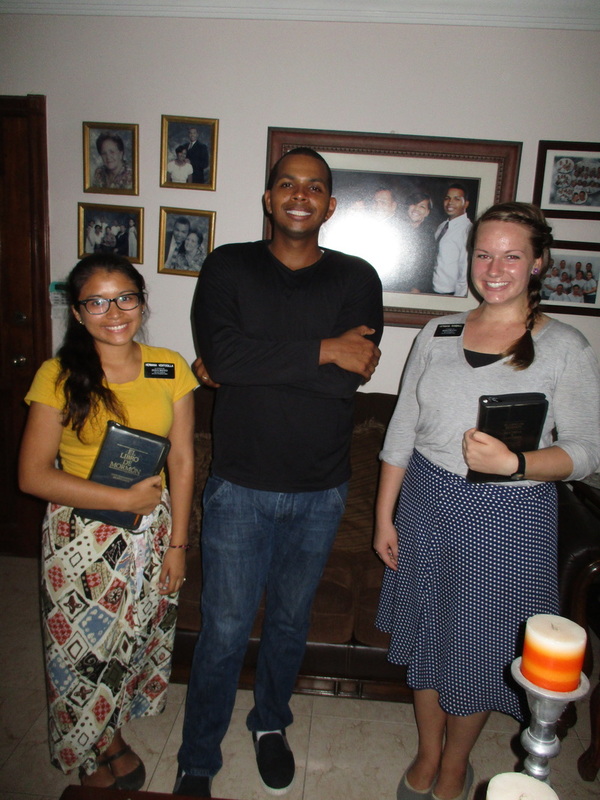 Rafael ended up being out of town for work, so we didn´t teach him, but Hermana Ventocilla and I worked on strengthening relationships with members, which was awesome. We also got to give a talk together at the baptism of Henry, an 8-year-old son of a member family. Yesterday, we had the most people in church that I've ever seen in the Bella Vista ward! Recently, nearly all of the organization presidencies changed, and the ward is already improving with the new callings. The members are also recognizing their lack of unity and are trying to improve it. In ward council yesterday, we made a game plan for obtaining references of new people to teach. In this area, it is an absolute miracle to get a reference--it's one of the best ways to find people who are interested in hearing about the gospel and are prepared to accept it. Okay, sad news: Yennel dropped us on Friday. She's the one who was raised as a Jehovah's Witness and married a Jew, so we got to help her learn about the real nature of Christ. She simply won't accept that there's only one true church and that salvation requires more than just faith and love. It was super sad. You'd think that after the rejection we face day after day, I'd be numb to it by now. But I still care. I still hope that someone will see something different in us, will give us a few minutes to explain what we believe, will have a desire to learn and change and progress, and will have the courage to take the necessary steps back to our Heavenly Father's presence. "And now, after the many testimonies which have been given of him, this is the testimony, last of all, which we give of him: That he lives!" 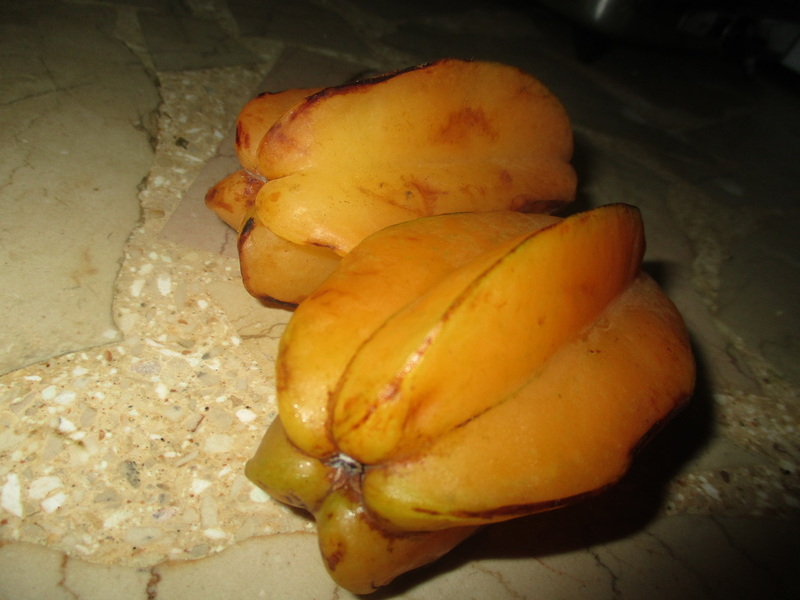 Island fruit is the BEST! 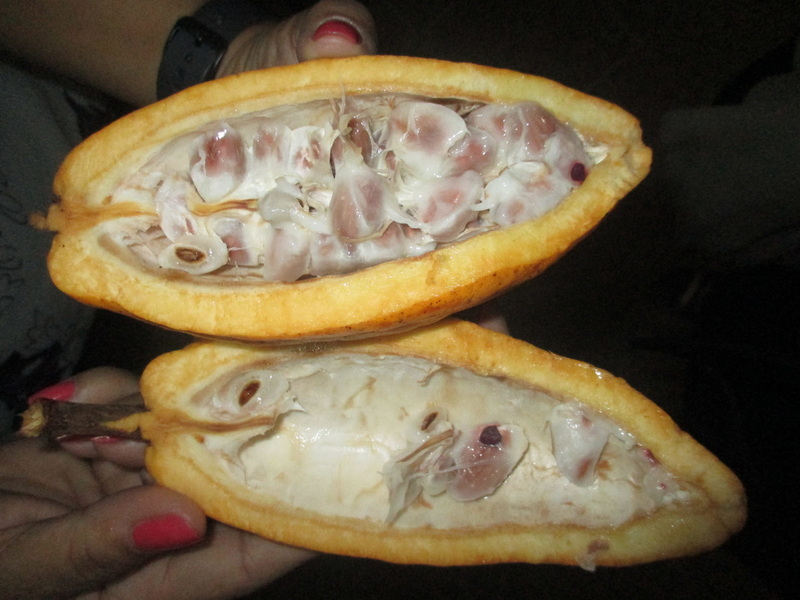 -Inside of a cocoa; you can eat the cocoa (chocolate) seeds straight. ​-Lots of ladies in Relief Society! I love our members! 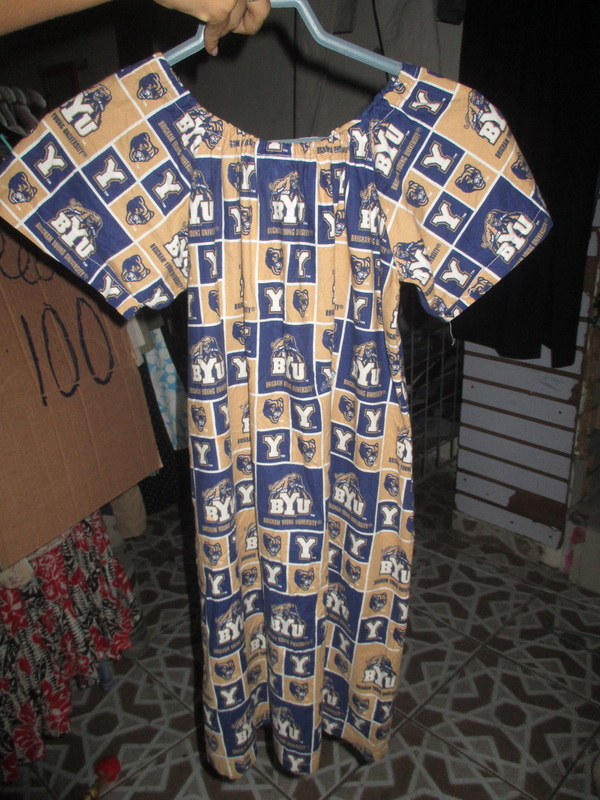 -I have absolutely no idea how BYU fabric ended up in this country, but someone made a little dress out of it, ha!